Business Description: We are a boutique entertainment company offering professional, Open Format DJs who work to be a reflection of your musical style. We're excited to explore your ideas that will guide us in the creation of a custom soundtrack which embraces your vision. Steve was AWESOME!!!! From start to finish District Remix was great to work with. Steve was professional, easy going and personable throughout the whole process! Leading up to the wedding he was super helpful and patient with us. The minute he arrived to the venue for our reception, he was prepared and reading the crowd....building the vibe we wanted for the evening during cocktail hour and was on point the entire reception! He really took everything we threw to him with eagerness & confidence! My (now) husband and I really wanted a dance party and he got everyone on that dance floor! We throughly enjoyed working with him and would highly recommend him!! 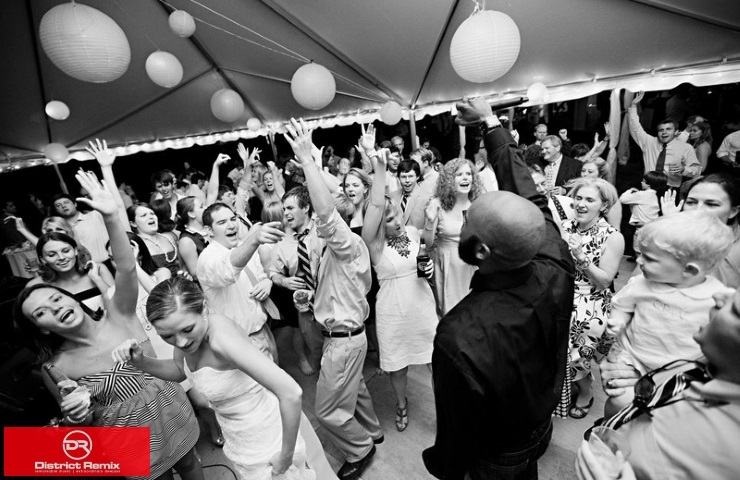 If you want a DJ who listens to your needs and facilitates a great party, look no further! We had Jason for our wedding and it was an obvious choice from the moment we met him. We live in Arlington, so he set up a video call to do a live demo for us at a time that worked for us. We talked for maybe 20 or so minutes about us, what we envisioned for the wedding and what music we were thinking for cocktail hour, dinner and reception before he launched into a demo. Only a couple minutes to prepare and he did a FANTASTIC job. Up until the wedding, he was extremely responsive and helpful when we had questions or wanted some suggestions since he really understood the vibe we wanted and was so knowledgeable about the type of music that would fit and not throw guests off. He even created a custom mix for my husband's mother/son dance, which was a huge hit! At the wedding, we got so many compliments on the music and told how the DJ was the best people had ever seen. Jason did a great job of reading the crowd and making sure to mix it up and get people dancing while also being a great MC and didn't say too little or too much. He was totally on top of it and we had an absolute blast at our wedding. Above all, he was just a great guy to work with and we really felt like he added to our wedding rather than just filling a role we paid him for. Highly highly recommend District Remix and especially Jason! You will not be disappointed! Jacob from District Remix was the first vendor we hired shortly after our engagement and we were so happy with him from the start. I first discovered Jacob and District Remix when I was a guest at another wedding years ago and I knew from that night that I had found a wedding DJ for whenever the time came. I was SO happy I kept his card! He invested time into what we wanted for our special day, and also what we didn't. Their online portal made selecting our songs a painless process. The dance floor was packed the entire night and we are still hearing from friends and family how much everyone loved our DJ. We highly recommend Jacob! Working with District Remix, primarily with Jacob had exceeded our expectations. Planning out our experience with their suggestions on specific moment really helped paint the perfect picture for what we imagined. Jacob played all the must have tracks & our a style that all age demographics were entertained & excited! HIGHLY recommend Jacob and District Remix to DJ your next event! Jacob djayed our wedding at the Chesapeake Bay Beach Club - the dance floor was packed the whole night, and his music selections were always on point. Everyone had a blast! Prior to the event, he was easy to communicate with, quick to respond, and always friendly and accommodating. He even made us a mixed tape of some of our favorite songs to commemorate our special day. THANK YOU JACOB!